On July 9, the day after visiting our first Sky’s the Limit Challenge site, we decided to go out and visit our second site in the challenge, located in Haley Farm State Park. Haley Farm is directly East of Bluff Point in Groton. The land was primarily farm and pasture land throughout most of written history. Today this is evident by the existence of miles and miles of stone walls that one of the owners was especially proficient at building. 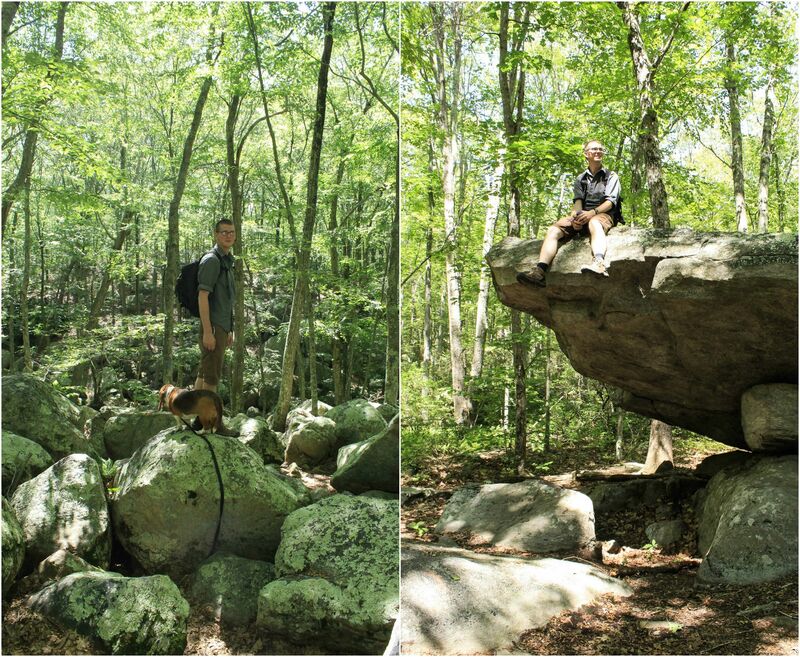 The Sky’s the Limit challenge brought us to ‘Canopy Rock’ , a glacial erratic on the South end of the park. It was a short walk and we soon got our picture and letterbox. Feeling we hadn’t walked nearly enough, we started aimlessly wandering the trails through the woods heading vaguely back towards the car, in search of more letterboxes. We were successful in finding two more, both hidden around different parts of the historic stone walls. Still wanting to prolong our Sunday afternoon outing, we decided to drive North of Groton to the town of Ledyard. There we found a rather unique park: The Ledyard Glacial Park, specifically the ‘Boulder Train’ part. Around the state and New England in general, there are often large boulders that appear ‘misplaced’. These boulders, called glacial erratic, were pushed forward by glaciers during the last ice age, to be left behind when the glacier melted. In the case of the Ledyard Boulder Train, this process became cyclical. Over time, hundreds and hundreds of boulders were deposited in the same area. They created a short loop trail that takes you through this part of the park, so we started off on the path, taking note of the warning posted at the trailhead: “Steep and Jagged sections ahead!” Of course, this is Southeastern Connecticut, so we were a little skeptical that it would actually be that steep. The middle part of the loop trail was the section they were referring to, which was more like a ravine filled with boulders. Being experienced hikers, it wasn’t any concern for us, but I can imagine it being more dangerous for children or people less steady on their feet. We had the entire park to ourselves, and we really enjoyed the trail for what it was. We also discovered that this is an awesome place to play “the floor is lava,” and went the majority of the trail hopping from rock to rock and avoiding the dirt path. We also found a few more letterboxes, and left feeling satisfied and glad we had found a somewhat adventurous place to explore, even in Southeastern Connecticut! That week, we were able to go out a few more times in the afternoon/evening and revisit places we’d been before. We returned to Seaside Point for sunset one evening, and attempted a letterbox again, to no avail. 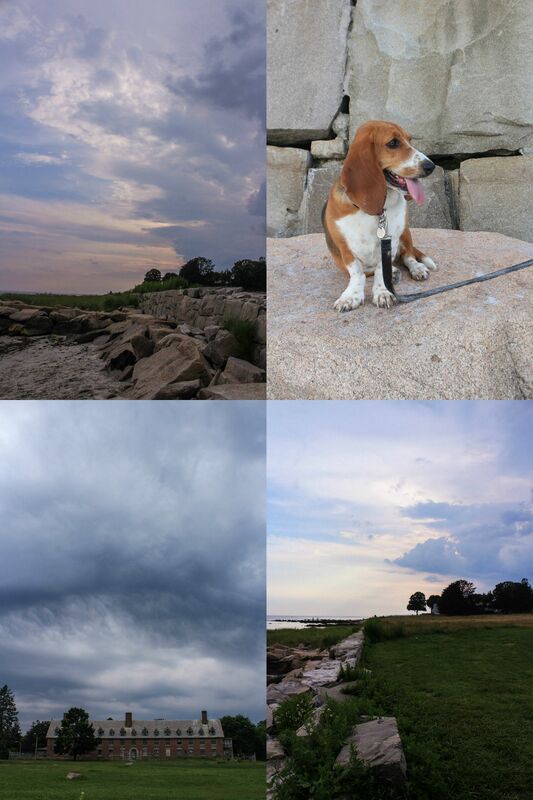 As we relaxed by the shore, dark clouds rolled in over the horizon, and minutes after we loaded up in the car and began driving home, the skies opened up in a downpour. Charlotte’s 3rd birthday was on Friday, July 14, so we went out for a little birthday hike around Bluff Point. We just walked the 3 mile loop trail around there again, this time seeking after a different letterbox series. Here, we experienced a new first for boxing: Curtis was going to find one box, but accidentally found another hidden nearby, which he didn’t have clues saved for. We logged in to both boxes, and he went to put them back. Then, in an attempt to hide the accidental find a bit better, he found yet another box! 3 in almost the exact same spot…that’s Connecticut for you! That was our third week in Connecticut…and now we’re going into our sixth. It’s crazy how fast this course is going by, compared to Curtis’ last year and a half of being in the training pipeline. He’s doing very well and is enjoying it — it always helps when he has an instructor that is down-to-earth, encouraging, and great at teaching. Charlotte and I keep busy while he’s at school, and we’re always excited to go out and explore when he has early outs. She & I also had a little adventure of our own…more on that later!